Life is working out so much better for me today. And I have also managed to tick a few more things off my list, which makes it even better. Yesterday I felt like the worst pms mess, or post mess rather. I even tried at the end of my workout to “Deal or no deal” on the treadmill. 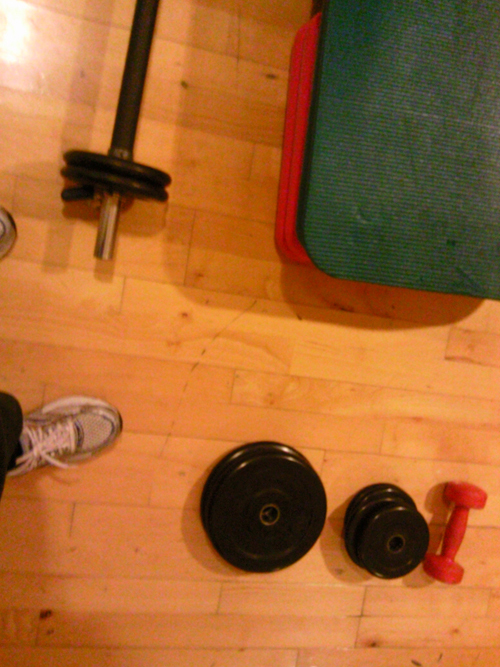 At the gym! Embarrassing. I got my prescription and walked through to the pharmacy and left my prescription slip. But a lady walked up to me and said that they did not have the pill in stock. They’d get it tomorrow. I said I have to start with the pill tomorrow again, so what time? She said she’s check it out and walked to the phone. I started crying (I know…). They had finally broke me down. Or maybe I’m just a sensitive one. Anyway, that didn’t help of course. Just have to try and get there tomorrow morning and see what happens. Would not be surprised if for some reason, the pills didn’t arrive with their delivery. There is a thousand other things that has gone wrong, and this week just feels like a huge fail. FAIL! Please let things turn around soon. 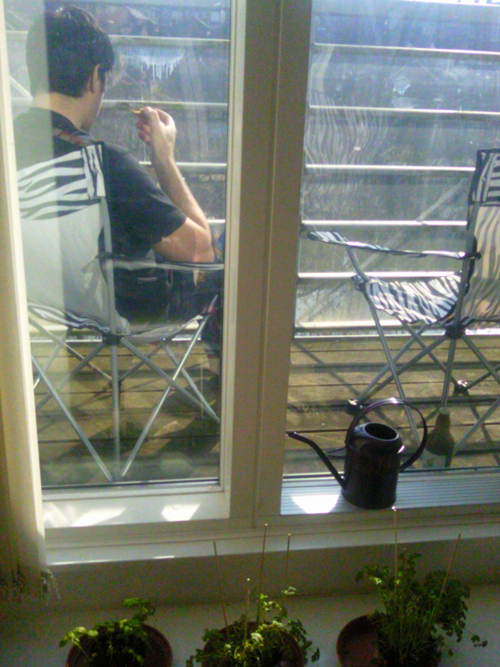 At least Jon & I had a nice morning with breakfast on the balcony. Too bad the guy was fixing our cupboards a couple of meters away from us. It looks nice now though. That we actually have cupboards for the dishwasher and and washing machine. Gaaah, this is driving me insane. I’m trying to collect my prescription for contraceptives. The pharmacy by my GP’s said they had had problems getting a hold of it and that I might be able to find it somewhere else. 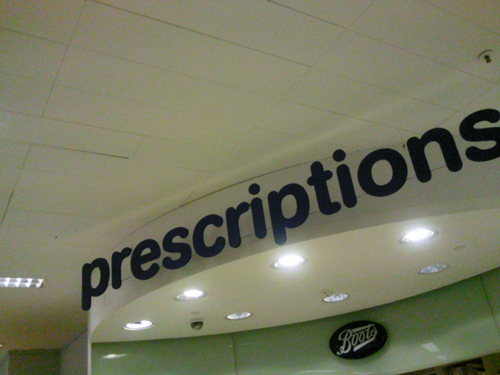 So I went to Boot’s pharmacy today, stood in the cue for ~30 mins with other sighing, annoyed people. When I’m finally served I am told that there is a “manufacturing problem” with the pill and that I need to contact my dr to get something else. Annoyed! Such unnecessary stress! Things like these should just WORK. It is hard enough to go to the Dr, get the prescription and wait at the Pharmacy. Having to chase your particular brand around town does not make it better! I figure it is best to do my food shopping and then walk pass my GP on the way back. So with my heavy bags I struggle up the hill to the surgery just to be greeted with an intercom and a locked door. “How can I help?” says a voice from a plant. I try to find where it’s coming from, speaking to a plant looks weird. Again, notice how these people only present you with the problems and obstacles – never a solution, e.g. “We’re closed, BUT…”. And then my brain added a few extra sentences to that conversations and I picked up my bags and struggled back down the hill. This is so extremely frustrating! I have so many things I need to do and I can never tick them off because the responding party can’t get to sort things out for me. Remember I mentioned I’ve requested a copy of my marriage certificate from RBKC. I wrote my first cheque, sent in the form with all the correct information. I was so happy Saturday morning when I found a letter from them already. And in it was a marriage cert as well, not ours though… So now I have to add “Call RBKC and sort out the wrong cert” to my to-do-list. And that’s how it is ALL THE TIME, my task list just keep growing the more I tick them off. Stupid incompetence! 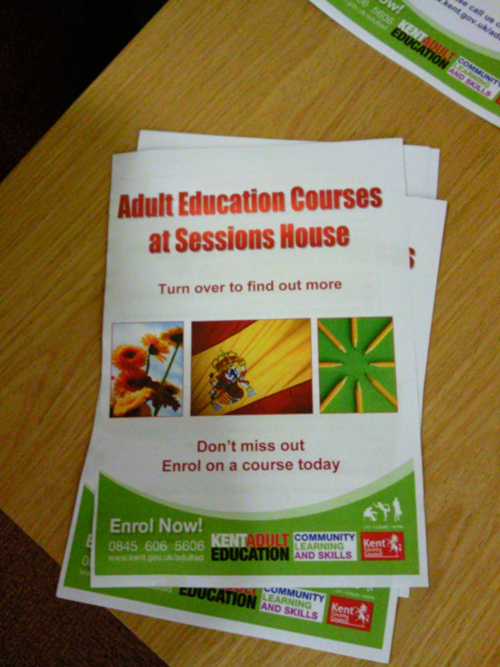 Why do public bodies still use Word Art on their leaflets etc? Gradient filled fonts – not very 2011! It is always a bit sensitive as a foreigner to criticize the country you live in and it’s public services. You’re always facing the risk of having the thoughts or words “Go back where you came from then” hailing your way. But is a matter of fact, I would be happy to do so. Sweden’s national health care is far from perfect. There are a lot of critical voices raised about it. But on a personal level; my experiences with the Swedish health care system has been a lot less complicated than the UK’s. It just feels like this country has built up a system that makes it as hard as possible for the public to communicate with public bodies. In Sweden I can get in the queue online and drive in just before you’re about to be called in. In the UK you can sometimes register on a touch screen when coming to the General Practice’s (GP) for an appointment, but even if the facility is there it usually doesn’t work. This all boils down to publicly spent money and politics in effect, which is not the topic discussed in this post. This is just about my personal experiences. Yesterday by the way, I had to write my first cheque ever. Cheques? I thought they were ancient remains dug up to from times gone by. But no… And who do I have to put this cheque out to? To the Royal Borough of Kensington & Chelsea. OK, it might be slightly, slightly charming. But come on, even Maidstone has an online service to buy and request copy of your marriage cert! And in London, LONDON, it is not possible. It probably annoys me even more because we’d run out of ink so I can’t print the form or postage. Anyway, back to the health care service. I have been meaning to write something about this before. I made an appointment 2 weeks ago to see a Dr yesterday to renew my prescription. Easy enough. My appointment was for 3pm. I was there ten to. And I waited, and waited and waited… Half an hour later I was let through. Besides the fact that it is absolutely unacceptable and disrespectful towards me and my time, at least you could have expected someone to notify me that the Dr is unfortunately running late today and is it ok for me to wait. I still wouldn’t have a choice but to wait of course, but it would have been very appreciated and it would have showed that they care and want to provide good service. Instead I was sitting there till a quarter past, wondering if the receptionists had failed to let the Dr know that I was there. Surely, the Dr wouldn’t go on and on if they knew I was sitting there. So I walked up to the front desk to make sure I was noticed. I was. Sort of. The Dr was just running late. Worth mentioning though, when I finally got to see the Dr, she was truly lovely and very informative and helpful. When I was sitting there waiting I was listening to other people. Well I wasn’t actually, for some reason, people are really quiet in a surgeries waiting room. Except for this one woman clearly in pain who kept making painful noises. But there was a few people talking to the receptionists during this time. Although they usually keep their voices down, I overheard a few things. There was this one walk-in to the surgery who wanted to register as a patient. Which was my situation not long ago. Just as me, her prescription had run out and she needed to see someone quite urgently to get it renewed. The receptionist said it takes a week to register as an answer. The client explained again that she would have run out by then. As did I. The receptionist said she could bring her old prescription and maybe the Dr could prescribe some more for her, or something along those lines. I was told something similar. When I was there though, that was not a sufficient answer for me. I had just moved to the area and came back from abroad. It wasn’t out of laziness I hadn’t registered earlier. And it is not very helpful hearing that you “might” be helped, I was stressed enough as it was. I had explained my situation and they were still giving me all the obstacles in the way of me getting the help I desperately needed. After having experienced this on two different occasions I am not just wondering what medical expertise leading them to deny me help in time, but also what training they have to cover a front desk dealing with people who are to a large degree very vulnerable? It is important that they keep a positive attitude towards the patients and make them feel that they are given options and solutions (even if it might not be exactly what they would have hoped, but at least an option) not stress them out even more and frustrate them more. In my days as receptionist, I was always taught to leave the visitor/client with two options: “Would you like me to ask him to call you back or would you like his number to call him back after 3?” for example. It makes the visitor feel that they are being helped. What I would want in that situation is to hear is that they will do everything in their power to assist me and that I need not to worry, that they understand that I need this medication and that we need to find a way to solve this. These are just words I realize, but the solution must not be that complicated either. Instead my encounter made me even more worried and nervous. Things did work out well in the end. When I came back the day after it turned out that I could use my old prescription from Peterborough. Voila! If I had only been told that in the first instance, or that they at least would have looked into solutions for my problem instead of being told what I could not get done. I asked several times: “Ok, so how do we solve this then?” Because it HAS to be solved. When it comes to medication that people need it doesn’t matter if they are completely unorganized and forgot their medication was running out and came do the Dr on the day of their last pill – There has to be a way to help, it is not up for argument. I suppose that is my point.